4.8.7.20 Labor relations is a broad spectrum of activities which concern the relationship of employees as a group with the local government as employer. It includes employee representation issues, negotiation of contracts, and preparation and conduct of interest arbitrations. 4.8.7.30 A labor relations consultant is someone who agrees to perform such services for compensation. For example, a labor relations consultant includes an attorney or other professional engaged by the local government to negotiate a collective bargaining agreement. It would not include a firm engaged to establish a personnel manual or to prescreen job applicants. The determining factor is the substance of services the consultant has been engaged to perform. 4.8.7.40 This schedule is used to identify expenditures for labor relations consultants: Disclosure should include identification of each consultant and the terms and conditions of each agreement. 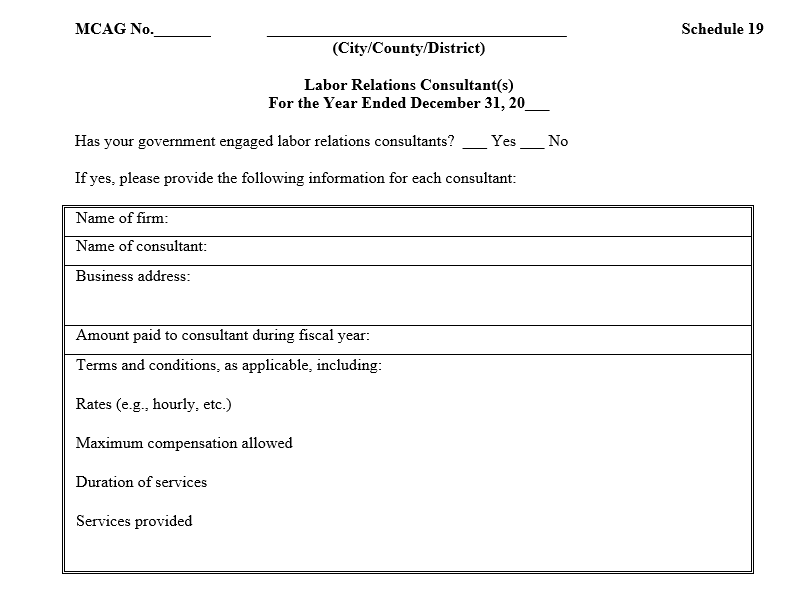 4.8.7.50 The schedule is required to be filed with the State Auditor’s Office whether or not your local government has labor relations consultants. Prepare a schedule for each consultant. Alternative formats are acceptable, including spreadsheets, as long as the required information is provided.